. . .Your brother hath done without you this many a year, and, as I gather, he hath never walked as far as Beaulieu to see you during all that time, so he cannot be in any great need of you." "Besides," said John, "the Socman of Minstead is a by-word through the forest, from Bramshaw Hill to Holmesley Walk. He is a drunken, brawling, perilous churl, as you may find to your cost." "The more reason that I should strive to mend him," quoth Alleyne. "There is no need to urge me, friends, for my own wishes would draw me to France, and it would be a joy to me if I could go with you. But indeed and indeed it cannot be, so here I take my leave of you, for yonder square tower amongst the trees upon the right must surely be the church of Minstead, and I may reach it by this path through the woods." 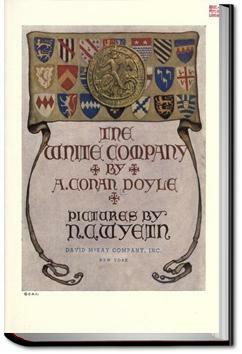 Arthur Conan Doyle alle prese col romanzo storico: un racconto medievale, con tanto di cavalieri, duelli, complotti ed una spolverata di horror. A delightful and strange adventure story in the vein of The Three Musketeers or The Scarlet Pimpernel, but also an early foreshadow of the Mannerpunk genre which grew out of Peake's Gormenghast books. I loved this one. I'm very happy I discovered this pearl by Sir Arthur Conan Doyle, an author I've come to appreciate after reading all the Sherlock Holmes short stories and novellas available.